Fernando Alonso dominated both Friday practice sessions, the fist one being very wet and the second being wet except for the very end. 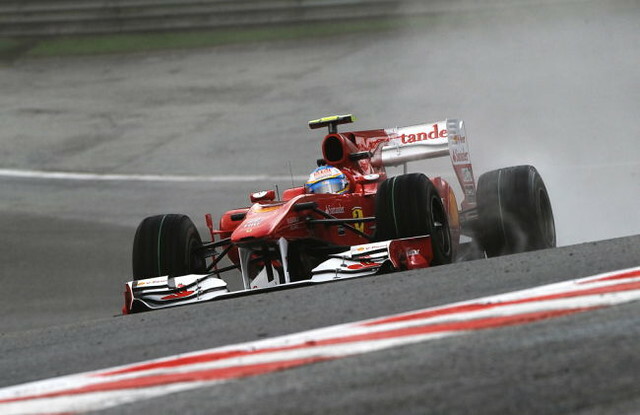 The Ferrari seemed pretty at ease in the wet but not especially in dry conditions despite the result. Nice result for Force India with Sutil certainly looking to raise his profile in his search for a different ride next year. Perhaps most interesting is the comparative lack of performance from the RedBull cars, I'm sure I'm not the only one wondering if the FIA stricter wing flex testing has affected them the most. Hard to say, since fuel loads are not known. and may have been concentrating more long runs. Speaking of aero, fantastic clip from under Jenson Button's nose, the water makes the airflow clearly visible. Yeah, McLaren is really bending the air around that wheel ... did you notice all the vanes & such mounted on the break vent? Would those count as a movable aero device? Qualifying isn't over buy that's still a good spot for the Force Indias right now - better than I would have expected.